ELKHART — Robert H. Schumacher, 84, of Elkhart, Indiana, passed away at 1:20 p.m. Tuesday, Nov. 9, 2010, at Eastlake Nursing and Rehabilitation Center. Robert was born Feb. 28, 1926, in Huntington, Indiana, to the late Herman J. and Beatrice (Needham) Schumacher. He was a 1944 Jimtown High School graduate and a World War II veteran, serving as a bomber gunner on B24s with the Army Air Corps. He served as an auxiliary policeman in Elkhart. He retired from CTS, where he had worked as a machinist foreman for 38 years. Robert was a member of Grace Brethren Church in Elkhart and was instrumental in beginning the church. Robert married Lois Ringler. She preceded him in death June 8, 2004. He was also preceded by son Mark A. Schumacher on March 10, 2010; and two brothers, Paul and Jimmy Schumacher. He is survived by five sons, Jeffrey W. of Bristol, Edward L. of Nappanee, Larry L. (Peggy) of Goshen, Phillip T. (Donna) of Elkhart and Robert H. Schumacher Jr. of Elkhart. A brother, John (Martha) of Glendale, Ariz., and sisters Evelyn Juday of Kenai, Alaska, and Phyllis (Bill) Smith of Lakeland, Fla., also survive. Robert has six grandchildren and nine great-grandchildren who also survive. A service for Robert will be at 11 a.m. Saturday, Nov. 13, 2010, at Zimmerman-Inman Funeral Home, 1109 Lincolnway W., Osceola, with Pastor Brent Poe of Beulah Missionary Church, Elkhart, presiding. Burial will follow with military honors at Chapel Hill Memorial Gardens Cemetery, Osceola. Visitation will be from 4 to 8 p.m. Friday, Nov. 12, 2010, at the funeral home. 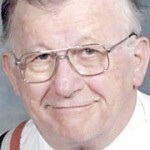 Memorial contributions may be given to Samaritans Purse Organization. Zimmerman-Inman Funeral Home has been entrusted with arrangements. Online condolences may be sent by visiting www.wmzfh.com.